Sometimes I laugh at myself... well, actually I do that a lot. I am FOREVER trying not to have to buy things that we may like, but instead, figure out ways to make them myself. I know I have told you that before. 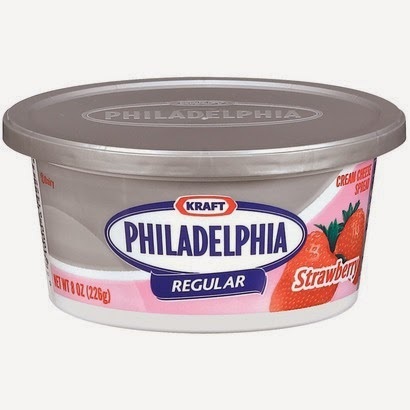 One thing I quit buying a long time ago was flavored cream cheese. My kids really like it. I used to buy it for our Sunday morning bagels. Bagels are perfect for Sunday morning around here, because we are all getting ready for church. One day I looked at the ingredients in the flavored cream cheese and was once again appalled to find that there was a lot of junk in there. Not surprised, but bothered, and I put it back on the shelf and said, I'm not buying this anymore... much to my kids dismay. So at home I pulled out some of my ingredients and my food processor and started mixing. It turned out SO good... I can't believe I waited so long! This is SO easy, and SO good! Another one we make that is very popular in our house is Chocolate Cream Cheese!